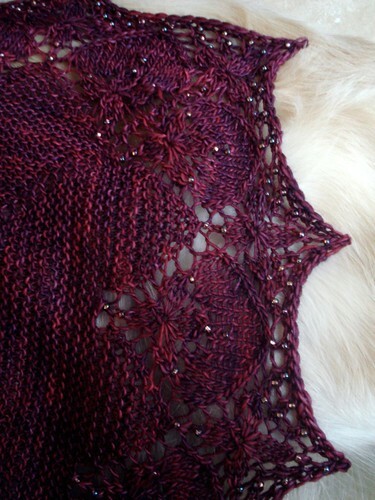 Since most of the wraps I do around here are lace, I thought I'd show you a detail of my Cambridge shawl, since it's not. It's got texture instead of lace. 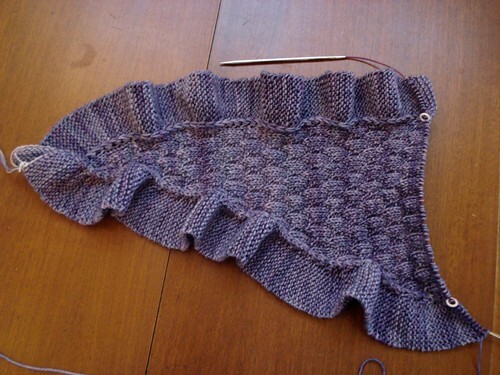 The ruffle (at the lower right) is garter stitch and the body of the shawl is a smallish, repetitive pattern of knits and purls. It's not as textural as cables, but the way the light hits the knit stitches differently than it hits the purls give the shawl detail, without any lace at all. I hope everyone has a great weekend! I'm enjoying the guesses about yesterday's Mystery Object. You'll find out soon, I promise. I've gotten back on the sleeves (or first sleeve) of the poor, neglected Austin Hoodie. I'm past the halfway point, but I didn't have a tape measure within arms reach last night so I'm not sure exactly how much more I have to go on this sleeve. I'll measure it today and see where I'm at. Second sleeves always seem to move faster for me because all I have to do is follow my notes from the first one - no stopping to do math and make notes, no finding a tape measure, just knitting. Of course, before I can start the second sleeve, I have to finish the first one. Guess I better get on that! You knew you'd see this one again soon, didn't you? I'm still working along on it and I'm still dragging it around in public. It curls up nicely in my lap while I work, so it's still getting to go places with me. I've had a couple of questions in the comments about this and about Logan, so I thought I'd answer them today. 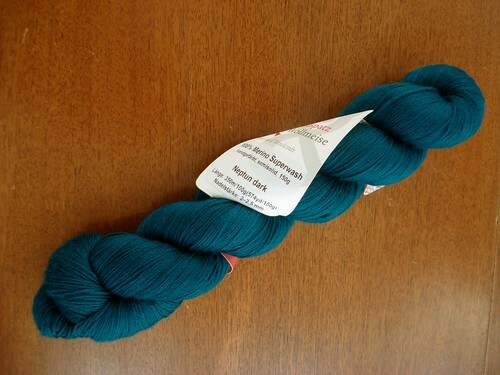 I'm planning on making the Medium size of Cambridge and according to the pattern yardage listed, I bought 5 skeins of the Madelinetosh Pashmina. I'm on the second skein now and I'm not even to the halfway point of the skein. 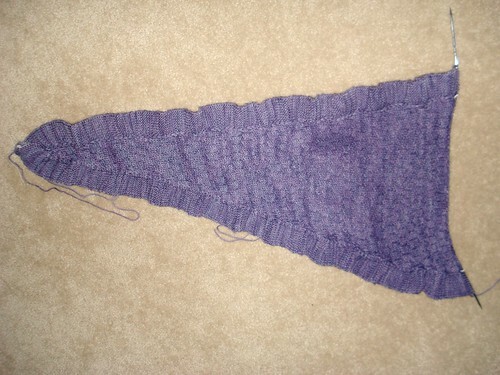 The shawl is looking pretty big and I'm getting to the halfway point on it. My guess is that I'll probably only use 4 skeins of the Pashmina to make this shawl, but I'm pretty sure I can find a use for the other skein. I'm not alternating skeins, but before I started, I laid out all 5 skeins and put them in order so the colors blended. (Yes, they are all purple, but it's handdyed and there are variations from skein to skein.) I think this is going to work since there is a texture to the shawl itself and while the purple in the skeins is within a pretty narrow range on the color wheel, it's not a solid colored yarn in any way, shape or form. The play of colors in the yarn and the texture of the shawl should pretty well camouflage the changing of skeins. If you look at the top edge of the shawl about 2/3 of the way across from the point there is a dark spot (it shows up better in photos than in real life). That dark spot was actually near the end of the first skein and it was all in the first skein. 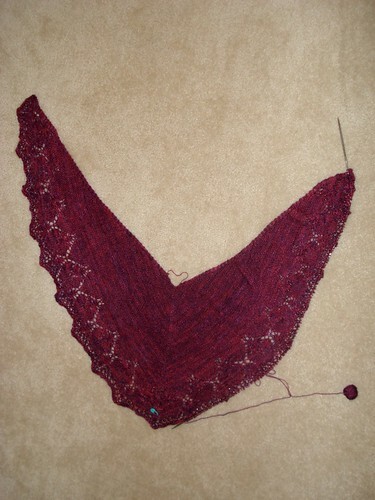 The place where the second skein was added in isn't visible on the shawl. All this is just to say that I think my plan to not alternate skeins every two rows and just add a new one when I get to it has worked so far - at least when I changed from skein 1 to skein 2. There have also been a couple of questions about Little Logan. Logan is a Golden Retriever but he's not an American style Golden Retriever. 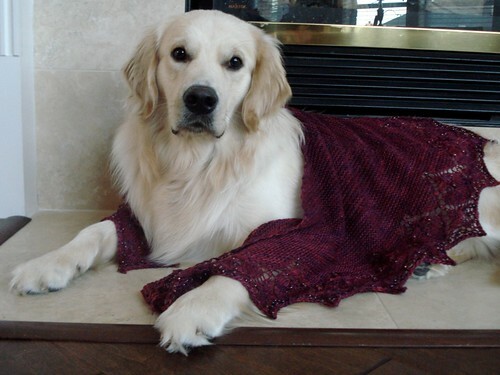 Logan is an English or European style Golden Retriever and while the only mention of color in the breed standard is that the dog must not be white or too dark (like mahogany), dogs bred to this standard tend to be lighter than the American type of Goldens. 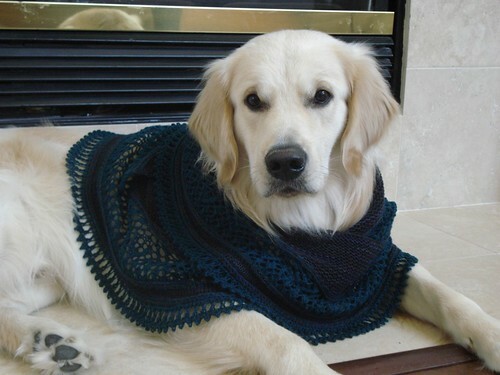 Logan is actually fairly dark for this type of Golden (the English/European). He's about the color of a lightly toasted marshmallow with yellow red ears. There are some differences in temperament between the American Goldens and the English/European Goldens but the intelligence, sweetness, friendliness, and general suspicion that your dog might have been dropped on his head at some point are the same. 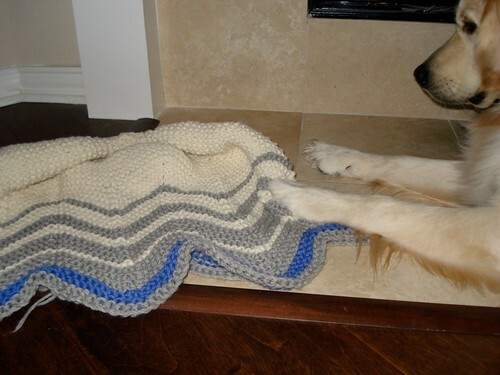 (Goldens are crazy, ask anyone who has one.) 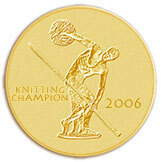 There are a few breeders here in the US who are breeding this type of Golden, but they're few and far between. We actually got Logan from a breeder in Ontario, Canada (Chrys-Haefen) and he's registered in the CKC, not the AKC (Chrys-Haefen Little Logan TK421 - bonus points if you can figure out the TK421.) If there are any more questions about Logan (and I don't mind at all), please feel free to PM me on Ravelry (PinkLemon) - that's easier than posting email addresses on the Internets. 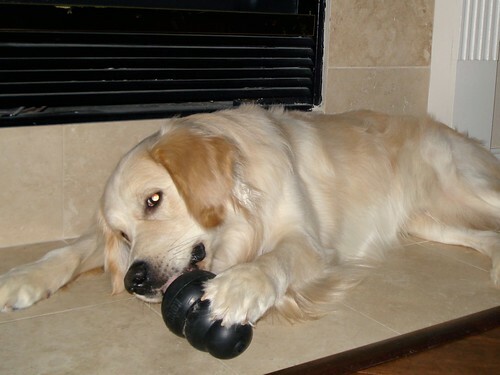 Who's chewing on his giant Kong toy - yum! I did knit this weekend, but I'm not ready to show it to you yet so all you get is information that I've knitted and a picture of Logan. I figure most of you are here for Logan anyway, and I can't blame you. I'll show you the secret project later this week or next week, so you won't be in suspense for long! I keep telling myself to work on the Austin Hoodie sleeves, but when I have a minute to knit, I grab the Cambridge. From the comments it seems that you don't mind seeing it again, which is good, because it's all I've been knitting on lately. I've finished the first skein and I've worked 2 rows in the second skein. I did get a little pooling from the first skein (see the dark spot at the top right?) which was surprising, but doesn't bother me. I have the stitch pattern memorized and it's going pretty quickly as long as people aren't talking to me too much (there's some counting in this pattern). As fast as this shawl is growing, I'm afraid it's going to be a stay at home project before too long, which will solve the problem of the talking people, but will slow down the overall progress. I might have something new tomorrow, but I wouldn't count on it. ... it's the same project as yesterday. Monday's are always crazy around here and my knitting time is limited so since I had packed up my Cambridge to carry around with me and knit in public, that's what got worked on yesterday. I really do try not to have the same thing over and over (boring blog, readers lose consciousness) but sometimes that's how it works out. There are about 5 more repeats now than there were 24 hours ago, but I'm still on the first skein of yarn. I'll probably go ahead and wind the second skein into a ball today though, so I'm ready for it when I get there. Try to control yourself with all the excitement around here. I hope no one has a heart condition. I know Friday I was babbling about sleeves, but I got distracted and decided to start something else instead. Back in April, shortly after marrying Prince William, Kate (the Duchess of Cambridge) was spotted going grocery shopping in a shawl! Of course the general public probably didn't get the significance of this, but Ravelry picked up on it and went crazy (or parts of Ravelry did). 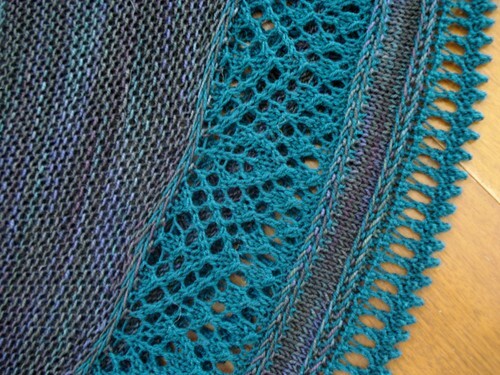 There are probably ten or more patterns for Kate's shopping shawl, both free and for sale, all slightly different. Being someone who loves princesses (even though she's just a duchess for now), I knew I would want to make one of these shawls. The fact that she wears it with a long tee/tunic, jeans and ballet flats means it would totally fit into my own wardrobe of tees, jeans and ballet flats. (Do I have royal style and didn't know it?) I decided to use the Cambridge pattern, and instead of a dark olive/forest green (or is it an olive in a dark forest? 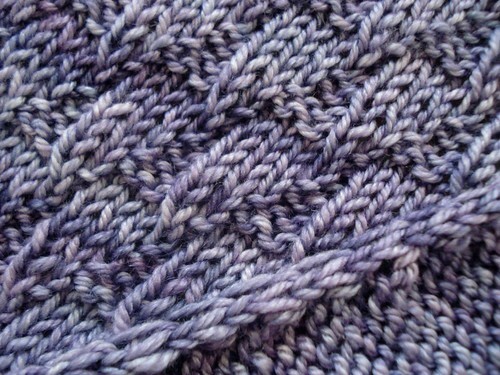 ), I decided to go with purple - Madelinetosh Pashmina (love!) in Logwood to be exact. The ruffles are done with short rows as you go and except for two tiny Kitchener stitch seams to join the ruffle at the beginning and at the end, there's no other finishing. This will probably be my drag around in public project because I've gotten the pattern memorized and at this point, it's not huge. I'm moving along on the sleeve. I know at this point it doesn't look all that impressive, but you have to go around in a lot of circles to get a sleeve and that's what I'm doing. Going in circles. 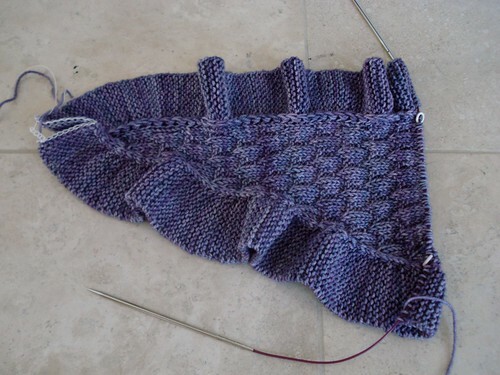 I'm going to really work on this cardi this weekend and see if I can't get some serious headway on it. I started it back in May and it's now getting (or thinking about getting) cool enough to wear it around here. Also, I've got other things I want to start knitting but I'm making myself finish this up first. I hope everyone has a great weekend and if you're going to be updating your iPhone (or iPod) with the new iOS5, make sure you've got several hours. I updated yesterday and it took a little over 2 hours (on my 3Gs), but it worked perfectly and put everything back how I had it. (Just a little public service announcement.) Now I've got to figure out how to use all the new stuff! Mommy finished up her Celaeno shawl (she helped me spell that) for her October Knit Something of the Month Club. I got to wear it this morning but I really wanted to help her with those little sparkly bumps that are on it. She says they're beads but I think I could pull them off for her and make it look better. This is me looking deep into the camera to hypnotize Mommy with my big, dark eyes. I figure if I can't get those bead things, maybe I can get some bacon. Mommy says I have to tell you what yarn she used so blah, blah, Madelinetosh Tosh Merino Light in the Bacon colorway, blah, blah. Oh, Mommy says it's not the Bacon colorway, it's Lepidoptra (she helped me spell that one too, but she isn't sure she even got it right). Here's what Mommy calls a "Detail Shot." I call it taking a picture of a shawl on my drumstick, which is a little weird. I mean, OK, the edge is kind of interesting (more of those bead things), but you can't see my pretty coat on my drumstick. I think I need to get some photos made without shawls because I really don't walk around wearing them in real life - Mommy takes them away from me when she's done getting pictures. I know where she keeps them though - in the closet place that I'm not supposed to be without "adult supervision" but I know how to open the door now and I play with Mommy's bathrobe which is a magical thing she puts on first thing in the morning to take me outside. It has a rope thing I can use to pull her along if she's moving slowly. All Mommies should have a rope thing to get them to move along in the morning! Oh, I've got to go, she's coming back and I don't want her to know that I can get into the closet by myself. Bye! I've started the first sleeve of my Austin Hoodie. 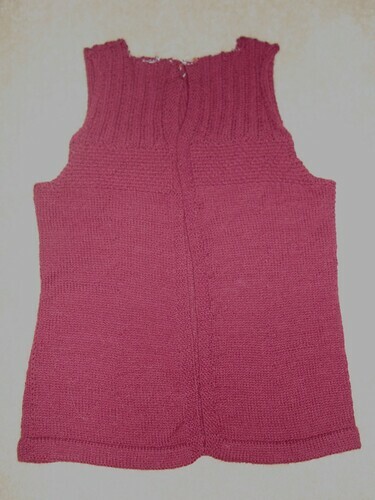 These are knit in the round, from the top down, and yes, they are set in sleeves. 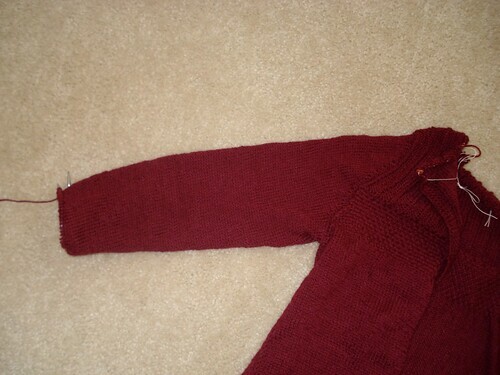 That means the sleeve caps are knit with short rows, but it also means I don't have to sew in sleeves later. Connie Chang Chinchio (the designer) did this on the Metro Cardi also. I did that one in black last Fall, and I'm betting she has other designs that use this sleeve technique as well. Anyway, I'm now to the part of the sleeve that goes round and round and round so all I have to do at this point is keep knitting and take notes so the second sleeve matches the first. It looks a little gathered and puffy because it's on a 9 inch needle. It will be a regular, long sleeve when it's all knit, not puffy. There was a comment on this sweater on Monday about the color and unfortunately both Monday morning and this morning it was overcast (today it was actually raining!) so the flash washed out the color some. I tried to correct the color, but it's actually a dark, wine red, not a deep rose. At some point you'd think I'd realize that reds don't photograph well, but as a brunette I just love reds too much to stop knitting with them. Sorry about that. I know it's already October 11 and I haven't shown you my Knit Something of the Month project for this month, but I haven't forgotten about it. In fact, I'm binding off now. I started it last Wednesday or Thursday and since garter stitch is easy even for sick people, I plowed through the first section pretty quickly. 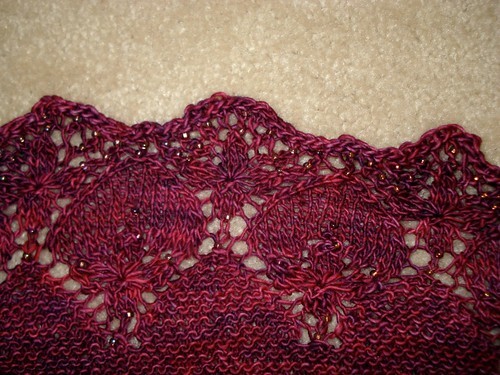 By the time I was ready to start the lace I was feeling better, so I just kept going. Now I'm just past the halfway point of the bind off. Oh, what is it? It's Celaeno from Romi's first ebook. I used Madelinetosh Tosh Merino Light in Lepidoptra. I didn't put beads in the top garter section because I didn't have enough beads (and the being sick), but I did bead the lace section as it was charted. I also skipped the last lace row on the chart because of yardage issues, but the pattern still works out without that row (I think). 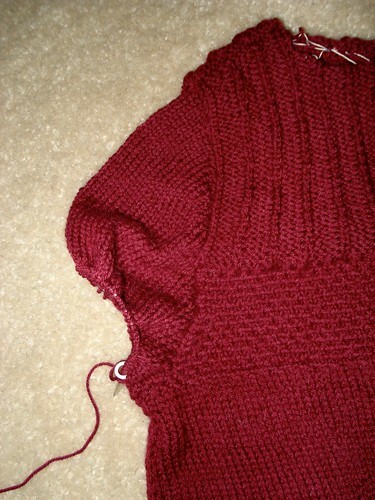 Once I finish binding off, I'll get it blocked so Logan can wear it. The silly puppy was hopping and dancing around yesterday morning, trying to model my Austin Hoodie, so I know he'll be happy to wear Celaeno. Sorry I dropped off last week. I've been sick and while I'm feeling much better now, I still don't have all my energy back. While this has meant that laundry is being neglected, knitting hasn't been. I finished up the fronts of the Austin Hoodie AND I joined the shoulders AND I wove in all the ends! There were a lot of ends. 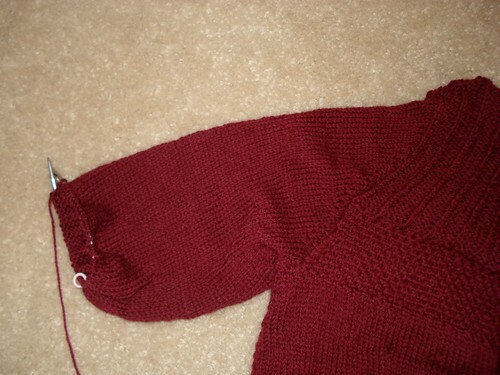 Next up are the sleeves, and I did get the needles in, so I'll do those before I do the hood. Now I've got to run. We have no food in this house and the dog fuzz tumbleweeds are starting to get bigger than the dog! 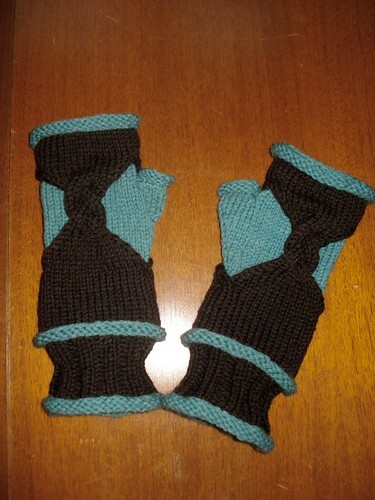 I've finished up my Chimera mitts. These were a fun project to knit and I love the way they look all finished up. I used Valley Yarns Northampton in Lake Heather and Chestnut Heather. The only change I made to the pattern was to go up one needle size on the outer layer of the mitt so they'd be just a little bigger than the inner layer (this helps the two layers lie nicely together). Other than that, I just followed the directions and knit my mitts! I finished my Kleio Saturday morning but didn't want to unpin it from it's blocking until I was sure it was completely dry. I enjoyed working on this design and I love the finished shawl. I used Socks That Rock Lightweight in Rook-y for the main color and The Loopy Ewe Solids Series in Malachite for the contrast color. 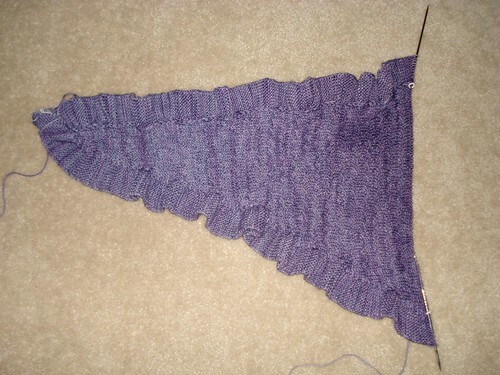 I decreased the cast on by two repeats because I didn't have as much of my Main Color as Romi did. The shawl still came out plenty big but I didn't have to worry about running out of yarn. The only other change I made was to use a US 7 (4.5 mm) for the braids so they wouldn't be too tight. The braids took a lot of time and the twisty yarns nearly did me in a few times, but I love the added texture they give to the shawl. And since we need a glamour shot to prove something is finished, Logan stepped up to help. This was his best photo shoot yet - perfect behavior! I got my Wollmeise! This was the prize for completing all three Camp Loopy projects this summer. This is the first Wollmeise I've ever even seen in real life and I just love the color. I got Neptun Dark which is a gorgeous dark blue green color. It's the Merino Superwash base, which gives me 574 yards. I'm thinking about making And So Are You with it (this pattern is part of an ebook with Roses Are Red, Violets are Blue, Sugar is Sweet, And So Are You, and Sugared Violets - the name makes more sense with it's other patterns). For now though, it's just going to sit with me so I can pet it.